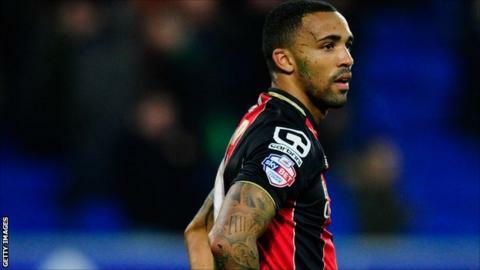 Bournemouth legend Steve Fletcher has backed star striker Callum Wilson to follow the example of Charlie Austin and score goals in the Premier League. Wilson, 23, arrived from League One side Coventry in the summer and repaid the Cherries with 23 goals this season to help fire them into the top flight. And Fletcher believes Wilson can replicate that form next season. "I think he can play top flight," Fletcher told BBC Sport. "I think he can score goals in the Premier League." Austin, 25, was plucked from non-league by Swindon before playing for Burnley and QPR. He has scored 17 goals in his first season in the Premier League and Fletcher, who is now part of Bournemouth's scouting and recruitment department, can see similarities. "He (Wilson) is a goal scorer and a good finisher," said Fletcher. "You can't take that out of anyone, it doesn't matter what level you are playing at. "You only have to look at Charlie Austin as a prime example, playing for Poole Town before his move to Swindon. "Scored goals in League One, got his move to Burnley and scored goals in the Championship and is now scoring in the Premier League. He knows where the net is and Callum is exactly the same." Wilson arrived at Bournemouth for a club-record fee, reported to be £3m, and Fletcher says the club practically "stalked him" before deciding to sign the player after he scored 22 goals in League One. Fletcher himself scored 121 goals in 728 appearances in a Cherries career spanning 18 seasons and he says Wilson has gone on to exceed everyone's expectations in his first season at the club. "We just knew that in the way we play football that he could be a big part of our set-up," added Fletcher. "I know he went to a couple of clubs but once he sat down with the manager, Eddie (Howe) worked his magic, showed the club's ambition and thankfully he signed 24 hours later." Fletcher added: "I always knew he was a good finisher, he is always going to get chances but the Championship was an unknown for him as he only played League One. "He's done more than we could have dreamed of. It's not just his goals, it's his overall play. His presence, his work rate creates so much space and he is appreciated by everyone in that team."